Anne Gale Hyde Bjorklund died on March 3, 2015. Anne Gale Hyde was born August 16, 1926, in the town of Englewood, New Jersey to her parents, Robert McKee Hyde and her mother, Lydia Tonetti Hyde. Angy is the younger half-sister of Susie Borden Hyde Macy whose mother (Dorothy Borden) died during child birth. Angy’s father, (Bobby Hyde) then married Lydia Tonetti. Lydia Tonetti gave birth to Angy, Joe, and Francois. Angy’s mother (Lydia Tonnetti) died early in Angy’s childhood. Angy also has a half-brother, Gavin Hyde, who is a published author who taught at the University California Santa Barbara and was born of Florence (Floppy) Hyde. Angy’s Grandparents, Mary Lawrence and Francois Michele Louis Tonetti, are well known Master artists and sculptors. The Tonetti Grandparents influenced cultural art in the United States of America during the Turn-of-the-Century. Mary Lawrence Tonetti was commissioned to sculpt a 50′ foot high statute of Christopher Columbus (Columbus) which was displayed at the front entrance of the Administration Building for the Chicago World’s Fair in 1893. Angy grew up in the Mary Lawrence Tonetti home, Pirate’s Lair, with her two brothers, Joe and Francois Hyde. Angy’s father, Bobby Hyde, developed the famous Bohemian communities known as: Mountain Drive; Painted Cave; the West 80 off of Old San Marcos Road; and the Maria Ygnacio Properties where the Bjorklund Ranch is today. Angy’s Grandfather, Robert Wilson Hyde, was an important figure in the cultural life of Santa Barbara. Robert Wilson Hyde founded the Community Arts Association in the early 1920’s and was instrumental in the discussions leading up to the opening of the new Lobero Theater in 1924. Angy moved into Granny Tonnetti’s Pirate’s Lair early in her life; her mother (Lydia Tonnetti Hyde) died too soon and her father, Bobby Hyde, had moved back out to the City of Santa Barbara and started his Bohemian communities. So “Granny” Tonetti (Mary Lawrence, the famous artist) took charge of the three children. With the help of the beloved butler, James, Angy grew up in an authentic artisan’s Estate at Sneden’s Landing which lies on the West bank of the Hudson River just North of New York City, New York. Granny Tonetti gave Angy a lust for life. At the age of 17, Angy was given a brand new 1943 Ford truck. After she learned how to drive her own truck, she started her own trucking business. She called it Angy’s Trucking. She found work in New York City. Another time, Angy mentioned to “Granny” Tonetti that she was interested in learning how to thatch a roof. In the spirit of fun, Mary Lawrence Tonetti sent letter to a workman in England of Angy’s interest in the old craft of thatching roofs. When young Angy, after a long, rough ocean voyage, arrived at the small hamlet of homes she knocked on the little cottage door. The old man answered, “Me thought you was only kidding.” She wasn’t. There was not extra room in the old man’s cottage, so for the next two months, Angy stayed in the old stone lighthouse where she slept during the night and learned the trade of thatching from the old man during the day. To stave off the freezing, night cold, she donned her warm, wool pajamas and downed just a small sip of old English whisky. Returning to Sneden’s Landing, from England, Angy began building her own stone house. The stones came from the crumbled down ruins of an old civil war fortress. When the walls got too tall she could no longer lift the stones. Angy needed a real man to help her. With four friends loaded into her Ford, they traveled across the country and finally arrived at her father’s Bohemian enclave on Mountain Drive in Santa Barbara. She found work in San Diego riveting WWII airplanes. She frequented Venice Beach and the boardwalk. There was a handsome Swede standing strong on the beach. He spotted the nice 1943 Ford truck and noticed the new fishing pole. She was moving into a little Venice beach rental and the Swede, Lloyd Bjorklund, offered to help with the move and to teach her how to fish. The couple fell in love. Angy took Lloyd Bjorklund back to New York. Together, in that quaint community of Sneden’s Landing, they lifted the final stones up onto the tall walls of her first finished stone house, the LloyAnne House. With news from her father-in-law, “Pappy,” that the government will give you homestead land if you build a house on it, Angy and Lloyd Bjorklund moved back to California. They lived a few years in the second stone house that they built together, the Desert Castle, which still stands at the homestead in the Mojave Desert. As a wedding gift, Angy’s father, Bobby Hyde, and his wife Floppy gave them 10 acres up on the Old San Marcos Road. On it, Angy and Lloyd built a third house, the White Tipi. The Bjorklund family (Robert Ivan Bjorklund) still lives on that land today. Angy and her husband, Lloyd Bjorklund, settled in Santa Barbara. She liked the Bohemian life style that her father, Bobby Hyde, was creating up on Mountain Drive. It is said about Angy’s father that Bobby was a man with an extraordinary dream … to create a Utopia where like-minded individuals could come together to live simply, in harmony with the natural world, using only the materials they had around them—earth, wood, stone, and water. Angy enjoyed the annual Wine Stomp which was the Bohemian Community’s signature party during the 1950’s. She participated in the reoccurring Pot War up on Mountain Drive during the 1960’s which established the beginning of the Renaissance Pleasure Faire. The Pot War event entailed the challenge of selling their handmade pottery roadside with an extra enticement for the buyer. Each of the sold ceramic creations came with a swirl or more of wine within. Musicians and Bards entertained the growing crowds each season. Angy loved the down to Earth lifestyle. Angy took on the ardent task of working with raw wool. 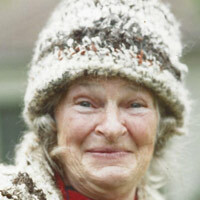 She carded it; spun it; dyed it; and knitted it into her famous ANGIE wool hats. She taught these arts at the University of California Santa Barbara. Music was always a huge part of her life, drumming, concertinas, and singing old songs. Making music made her life an ever-blooming flower. Angy’s father (Bobby Hyde) at the age of 55 adopted six additional children, aged 4 through 12. Angy suddenly became the older sister to six, new siblings. Bobby Hyde wrote about his Rodriguez children in the published book, Six More at Sixty. Angy’s four children grew up with Aunts: Martha, Ruthy, Becky, and Naomi; and Uncles: Paul, and Cecilio. As a mother of four, she vacationed each year with her family at Quadra Island and Cortez Island in British Columbia. The family of six stayed in yet the fourth, family-built, small, Quadra Island cabin that was perched atop the granite bluffs just above the high tide line in Village Bay. Angy always feed the family fresh salmon, cod, and oysters straight from the cold, bay waters. And her hot baked bread filled the air with a wholesome, natural smell. Angy purchased 50-acres of ocean front property in Whale Town on Cortez Island which provided the family with abundant diversity of hunting, raft building, gardening and picking wild berries and cherries from the tree. During that vacation time, she often put her kids to work on the rock bluffs to scrape for lichen which she used to die the wool natural golden brown tones. Her children, over time, finally got used to the smell of the of the moss-like lichen. On the way home from British Columbia, it was tight quarters in the car because the car was full of wool from the Canadian sheep. Angy was ready for another year of working her wool projects. Angy is a Third generation Santa Barbarian who taught her children to be creative and entrepreneurial. The Tonetti tallent pulsed within her every creative whim. And her Father’s and Grandfather’s (Bobby and Robert Wilson Hyde’s) spirit guided her many salient endeavours. Throughout her life, Angy garnered so many dear friends. She was always genuinely peaceful and loving toward everyone she met. Her health was good. On March 3, 2015, Angy’s family gathered along her side. The room filled with the old folk songs that we had learned from her. Stefana, a hospice volunteer, played the guitar for Angy. Norma, the 90 year old roommate resident, joined in the singing with a beautiful rendition of Amazing Grace. It was a time of beautiful grieving. Shortly thereafter, Angy raised her sail, caught the evening wind, and moved across the seas; like the ending to a beautiful song. Angy lived a free-spirit life with her husband, Lloyd Bjorklund, and their four children. She is survived by her sister Susie Macy now living at Martha’s Vineyard and her brother Gavin Hyde who lives at Painted Cave. Angy’s four children; Eric, Robert, and the twins; Susy and Gail will miss her joyful song. Her seven grandchildren: Torin and Axel Bjorklund; Harmony and Savanna Bjorklund; Micky and Lydia Kitahara; and Lloyd Jeffers will remember her fondly. Angy’s celebration of life party will be held on Sunday, the 29th of March, 2015, starting at 12 noon. We welcome all who wish to celebrate our mother’s life. Wear festive and bring warm clothing as the celebration will be an ongoing, outdoor event. Overnight tenting will be available. Send in a fun story about a special experience that you had with Angy. Your story will be printed into a book of memories. Please RSVP by March 22, 2015: efbjorklund@gmail.com. Or call Susie (707) 357-3714. On the day of the event, shuttles will be provided to drive visitors up to the Bjorklund Ranch on Old San Marcos Road. Please park your car on Cathedral Oaks near Foothill Elementary School. A Door-to-Door mini-van will take you up to Angy’s Celebration. (shuttle information on the 29th call Jonathan (805) 689-6107. Special needs call Rob (805) 705-1154.). The vehicles will run the route up and down the beautiful drive. You are invited to bring music, photographs of and Artwork produced by Angy Hyde Bjorklund (1926-2015). To see her life in pictures click here and turn to page 58.